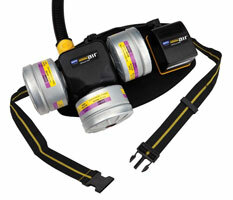 The North Compact Air Series 200 Powered Air-Purifying Respirator’s triple alarm system creates an audible, vibratory and visual alarm to warn workers about battery life and/or a filter clog. The vibratory alarm can be felt even through welding jackets. The PAPR is lightweight for improved comfort and longer wear. Airflow is automatically adjusted to meet OSHA and CSA requirements.